HopeKeepers Magazine is in the works. We are going digital since we are still in debt from the last print job. But at least we aren't shutting down like dozens of magazines. We know many of you have questions, and I have tried to answer all your HK Magazine questions here, so check out our FAQ before emailing me, and you will get a faster response, K? Do you have a wordpress blog and would want to volunteer to help us update our HopeNotes blog? Did you know... this newsletter is posted on its own blog! Each section is posted separately under different categories and then the whole ezine is also posted as a text file. This means you can search fast for what you read in a previous issue, get a Widget to put it on your own web page or blog and also comment on the articles... which we hope you will do! Does God Want Me Well? There are some people today who teach that it is never Gods will for a believer to be ill, and that illness is the result of specific acts of sin. But is that true? Is illness always an indication of lack of faith in a Christians life? Does God Want Me Well? explores what the Bible says about healing and looks at four biblical certainties that offer hope to believers who are enduring times of sickness. 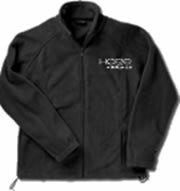 Fleece Jacket that spreads the word about our new HOPE ENDURES radio show! Snuggle up in this cozy fleece zip up jacket that will flatter any figure. Zip up pockets on both sides, stylish stitching on the back and the "Hope Endures" embroidered logo will make this a "keeper" for many years to come. Do you want to share your testimony or story? Do you have news you think would help others? We'd love to hear from you! >Is this too small to read? I kept waiting for some words of wisdom or inspiration to hit me to write in my note today. Honestly, I am just tired. I awoke at 6 a.m. hearing my son cough, and so eventually got up at 6:30. He was fine and went off to school, but I've dragged through the day, finally laying down from 1:30 to 2, setting my alarm before picking Josh up at school. Ever have some days you just want to crawl under the covers and ignore all the little responsibilities? For me it's not the big ones that take the time, but the little things add up.. Today for example, I took my empty toner cartridges to the school to donate for the PTA, figured out what to buy for a "sundae basket" to be auctioned off at the school, filled out Josh's Tae Kwon Do task sheet so he can get a star, had a friend over to play (not me... my son), answered about 50 emails, worked on the magazine, figured out tomorrow's radio program and my husband is getting dinner out of a can (clam chowder... hey, not so bad, right?). Writing about it makes me feel a bit better. Just like Claudette's interview last Tuesday, we all feel like we are not doing enough. Personally, I need to go back and listen to it myself! 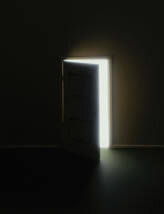 Isn't that a nice reminder that God will lead us (even when we cannot see) through new paths! I'm clinging to that one every time I feel in over my head! I hope you enjoy this week's issue of HopeNotes and that you will join me tomorrow morning at 10 a.m. pacific for our radio show Hope Endures as we talk about all thing support groups! God bless you and thank you for your daily encouragement! Yes! 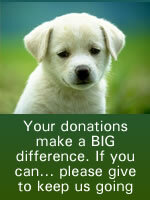 I can make a donation to help Rest Ministries continue their outreach! We ordered more copies of Mosaic Moments, our devotional book, since we were sold out! To celebrate, we put it on sale. 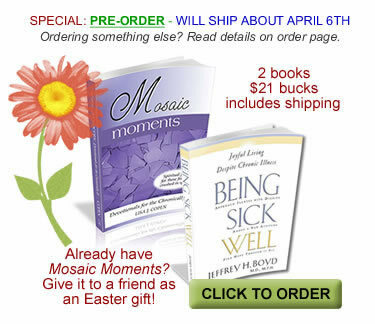 Buy the book Being Sick Well and get Mosiac Moments for free (for a limited time). It's a pre-order. Books will be available about April first. 2 books for $21 includes shipping - wow! Lisa participated in the How to Cope with Pain February Blog Carnival that posted this week. Find some great articles! We had a great podcast on Thursday talking about money and finances! Listen here. Claudette Palatsky joined us Tuesday morning for our radio show discussing when we feel guilty for not doing enough. Have a listen - you won't be sorry! It's one of our best! Lisa ordered some cute little notecards that say "Hope Endures." They will be in our store soon. And yes, we're still working on both the new store and HopeKeepers Magazine. Stay tuned! Do You Want Illness Articles on Your Web Site? Lisa now has a blog of just chronic illness articles that are free to reprint and also a "widget" of code you can put on your web site of just her articles about chronic illness. This replaces former code many people were having difficulty with. Click here to set it up. One of RM's Best Sales This Year! Hi, I am just letting you know that God has performed some miraculous things in me over the past year. I have had the earnest desire to get better and God has healed me in many ways. He has healed me so much physically, mentally and spiritually. I came from suicidal, depressed, anxiety ridden, angry, bitter, bulimic, and a smoker who was broken to the uttermost. God was performing a work in me, but I had to become broken to be reshaped. I haven't been bulimic for almost a year, and I haven't smoked for five months now. I also have been released from my therapist and have returned to the same type of medication for PMDD as before. I worked in the prison 5 years ago. I was on 3 different medications to start with after I was hospitalized in the psych ward in Oct. 2007. Now I am working part time only and getting to spend so much more time with my kids and reading my Bible and with my dogs and RESTING! I recently learned that believing is doing God's work and He is teaching me that I don't have to be working myself to death to serve Him - "His yoke is easy and His burden light." I am truly blessed and I may not be wealthy in America's eyes but I have riches that go beyond any human understanding - in Christ. It is so great to have a place for Christians with depression and other mental health issues to go to to relate with others who understand. It is such a misunderstood topic among Christians so in saying this, may God bless your ministry and bless you in it. Thanks so much! Lots of sister love and hugs.....always! We need your stories! We know many of you have shared them with others in different areas of our web site. Please share a bit about yourself, what illness is teaching you, your struggles, whatever! An ABC News article says, "When it comes to chronic pain, the issues and questions are different for children. Because children may have a harder time communicating, determining the cause of a child's pain can be difficult for doctors." To read more about treating kid's pain the influence a mom can have click here. Women: Oops! Is Your Blouse Too Low? Get a free chapter of the Bible study from The Love Dare journal featured in the movie and written by the creators of FIREPROOF. This eight-week study is based on Using Scripture, commentary, and provocative questions that inspire fiery group discussion, couples can return their marriages to the covenant relationships God intended them to be. Download it here. Listen to an audio message from Michael Catt, co-writer of FIREPROOF. Looking for Healthy Food Choices for Your Family? Even if your kids aren't at home anymore, check out Healthy Moms, Healthy Families where you will find recipes and all kinds of Christian encouragement. Founder, Connie Bendickson says, "It's been nearly ten years since my family began learning about and transitioning from the standard American fast-food diet to healthy, whole, plant-based foods that God created for the purpose of nourishing our bodies. While it may not be easy in our fast food culture to break away from the pattern of this world, it is definitely possible and it is definitely worth it." Last week this weekly newsletter offered a free chapter from Sheila Walsh's new book Let Go on the TCW Editors' Blog. It may still be available, but you can check back every Friday for a free book chapter, song download, or Bible study! Thinking of starting a support group? Wondering what you can do to get more people to attend your HopeKeepers group? Have you been blessed by a group? Or maybe even hurt? We'll be discussing everything support groups on Thursday, March 4th, at 10 a.m. pacific! Join us! There are 2 shows per week. You can listen live and call in to ask questions or comment, or listen to the archived shows at any time. Tuesdays at 10 a.m. - Join us and a Special guest who will share how s/he has found hope despite living with chronic illness or pain and offer tips to encourage you! We take callers too, so you can ask our guest questions. Thursdays at 10 a.m. is our "Rest Stops" program. Discover what is going on at Rest Ministries, meet volunteers, HopeKeepers leaders, call in to share what is on your mind, be encouraged with Lisa's reflections and Christian encouragement. You never know what may happen on Thursdays so don't miss this special program. Log on at the Hope Endures web site to hear the broadcast. You can either listen to it online or listen to an archived show with your MP3 or ipod player. Stay tuned... because once we have a selection of shows they will also be available on CD. Thank you to our kind friends who tell us how Rest Ministries is making a difference. We share this with you, not to toot our own horn, but because so many of YOU ARE our ministry! Your kindness to strangers in the Sunroom, your answering prayer requests, writing devotionals, or encouraging devotional writers... You are all appreciated and we want you to hear just how much God uses you ever day! "Thank you so much for this article. While I understand support groups can be highly beneficial, I've often felt they are sometimes forced upon those who really don't feel drawn to them. I had attended a few in the past and felt that I must be an outsider to feel so unattached, but your eight reasons explained my independence more than I understood it." Even as a biblical counselor and minister, I greatly benefited from listening to this program. It is always helpful to hear words of truth from transparent people who are doing all they can to be more like Jesus. Very encouraging and enjoyable! Thanks! People are always asking, "How can I help Rest Ministries?" With the internet, it's easy to help spread the word. With just a few of us working together to write a review someone or "Stumble Upon" an article, Rest Ministries can gain tons of exposure without having to spend a dime! We'll share a suggestion here each week, where if you can take a minute it will help us reach more people! We have a new blog where all of our devotions are posted each day. By posting a comment after any devotional, you are encouraging both our writers and all the other readers who come and visit the web site and know they are not alone. "When I was on my feet, big boisterous pleasures provided only fleeting satisfaction. In a wheelchair, satisfaction settles in as I sit under an oak tree on a windy day and delight in the rustle of the leaves or sit by a fire and enjoy the soothing strains of a symphony. These smaller, less noisy pleasures are rich because, unlike the fun on my feet, these things yield patience, endurance, and a spirit of gratitude, all of which fits me further for eternity. It is this yieldedness that gains you the most here on earth." Did you know we really need your prayers? In the last few months we've had volunteers who have suffered heart attacks, lost their home, lost a loved one, had additional illnesses diagnosed and more. Our ministry is blessed, but at the same time we have computer crashes, administrative issues and all kinds of things that just remind us that though God is in control, the enemy desperately wants to slow us down! We have a great list of things you can pray for us about for 2008. Print it out here and stick it in your Bible or on your fridge, and remember us, okay? It's very appreciated! You are receiving this email because you signed up for HopeNotes, the email newsletter of Rest Ministries which serves the chronically ill. (In case you're confused, it's different than HopeKeepers Magazine which we publish and is a 64-page digital magazine that has a fee-based subscription.) If you want to be removed from receiving this ezine again instructions are below. Thanks!